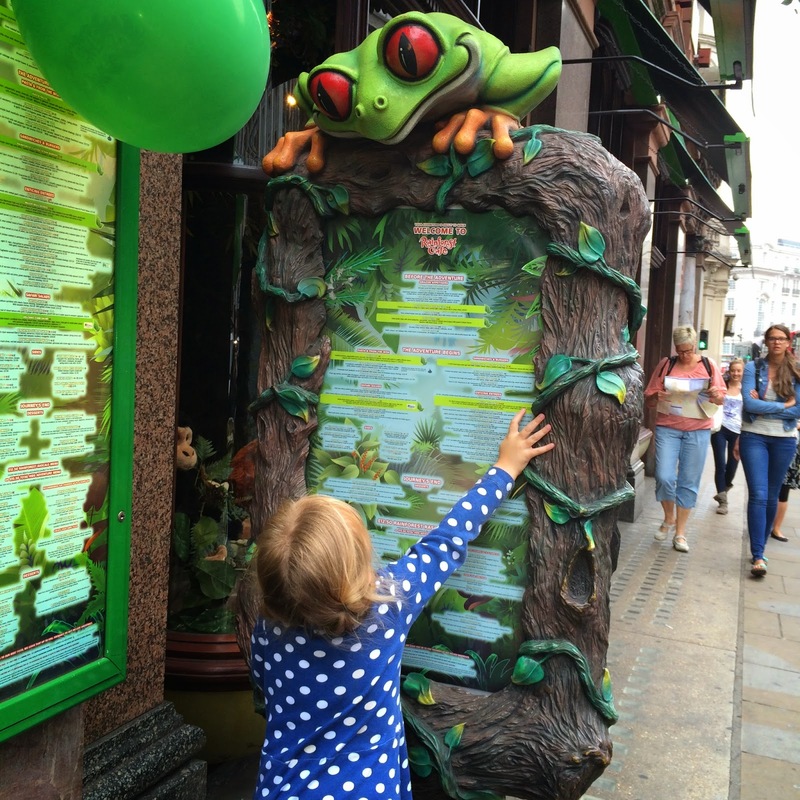 Last week I was kindly invited to review The Rainforest Cafe on Shaftsbury Avenue, London. I took along one of my mummy friends, Anwyn, and her two little girls (aged 3.5 years and 17 months), as well as Bert (10 months) for lunch - and wow, what a great time we had! 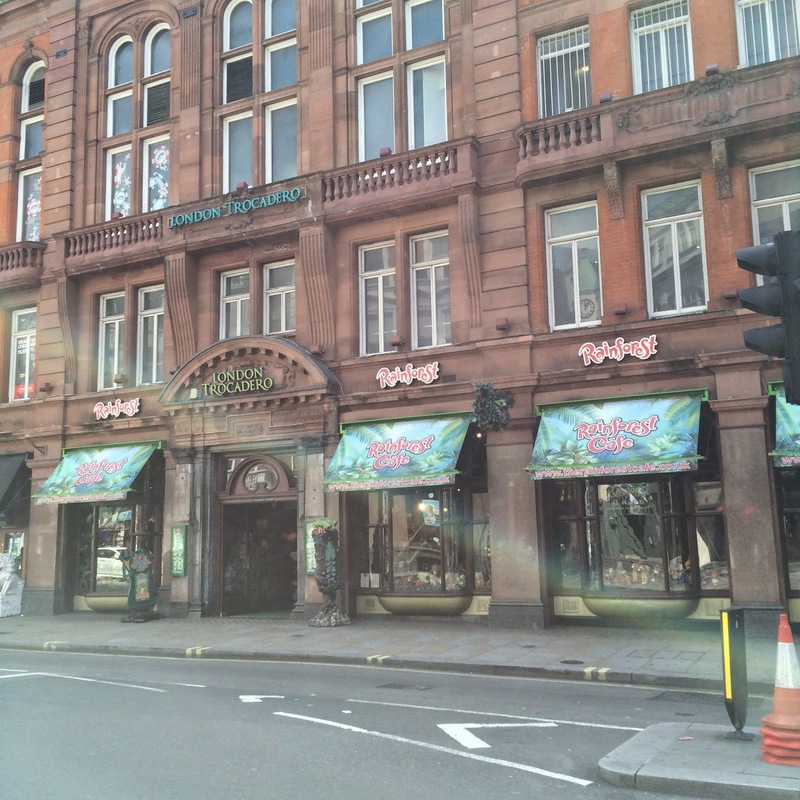 Located in Piccadilly Circus, The Rainforest Cafe is a unique and vibrant restaurant and shop, bringing together the sights and sounds of the jungle. 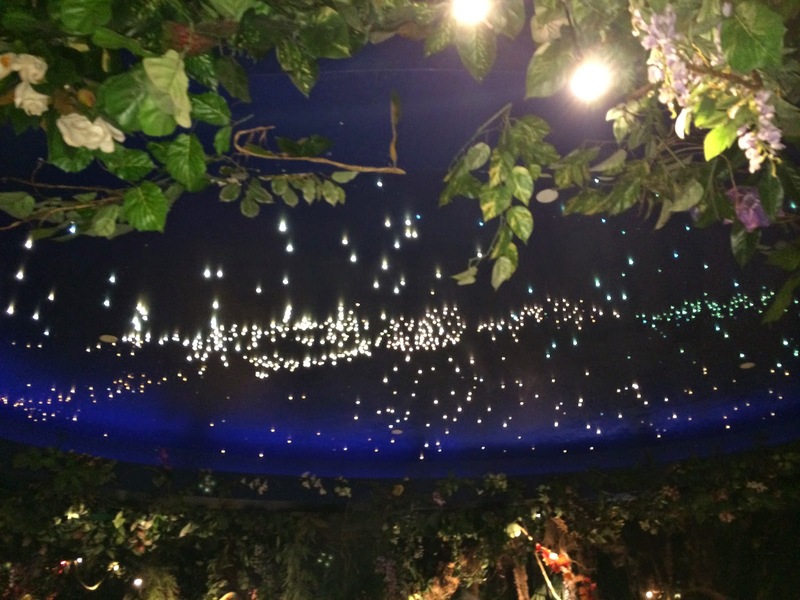 It has a collection of moving animatronics, waterfalls and tropical fish tanks, as well as floor projections, a full night sky and awesome rain/thunder storm effects running every twenty minutes or so. We were blown away by the amazing ambience inside the shop and restaurant, my friend's 3.5 year old girl was jumping around and didn't know what to look at first! 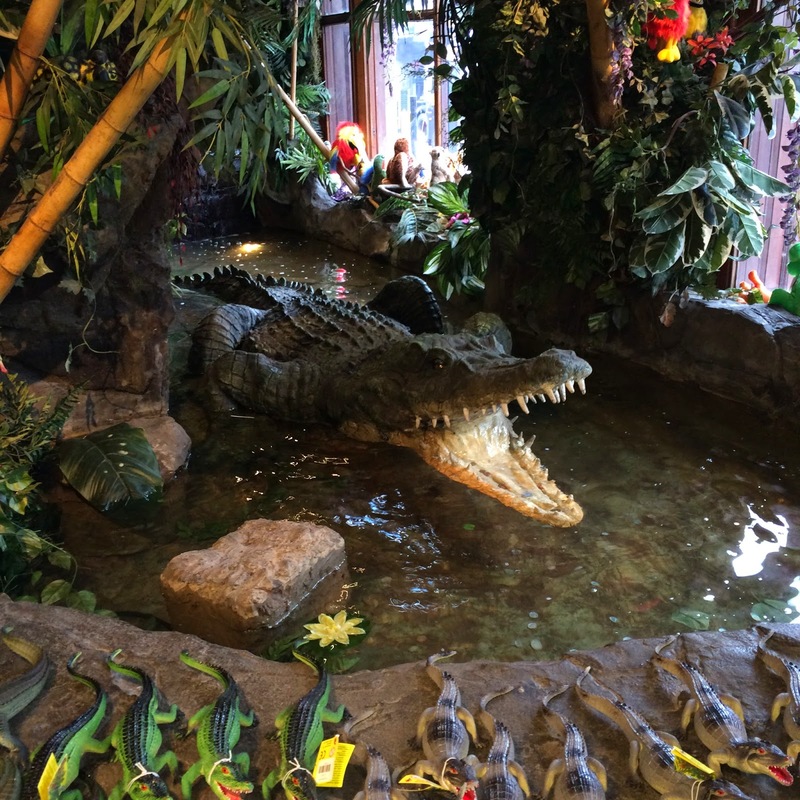 When you first walk in to RFC you are greeted by a rather fierce looking crocodile in a lagoon - his mouth opens and closes, and he makes really lifelike noises (I'll pretend I know what a croc sounds like in the flesh!) 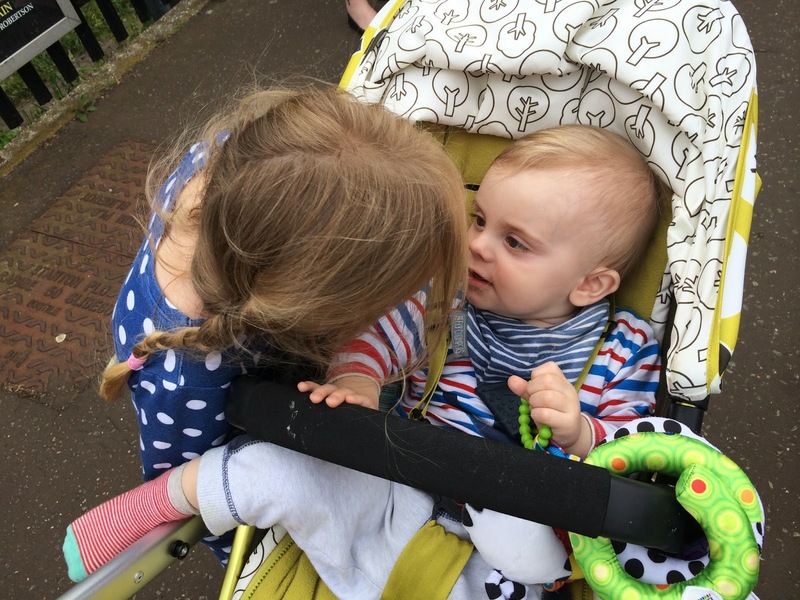 … The kids were mesmerised by him (if, a little frightened) … what an entrance! Bert with a rather sinister looking beast behind him! Upon arrival with two pushchairs in tow we were a bit flummoxed when we realised we couldn't take pushchairs downstairs from the shop to the restaurant. It's worth baring in mind when you plan your visit that staff ask you to leave your pushchair in a store room, so you'll need to keep all your valuables on you, and carry babes-in-arms downstairs. Our welcome to the restaurant was a hearty one, all of the staff were incredibly friendly and showed us to our amazing table. We were seated amongst the absolutely huge Elephants who move and make realistic elephant noises every 15 minutes or so. 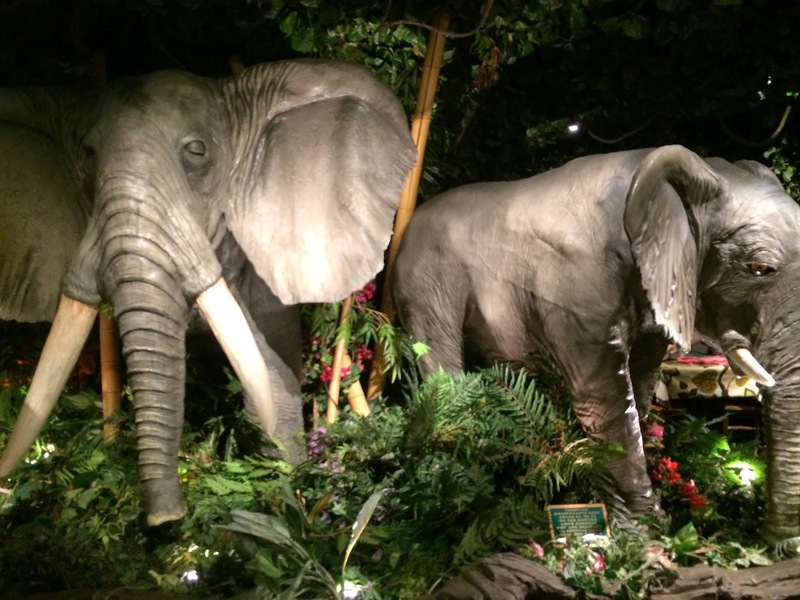 Our table was positioned right next to these amazing elephants! 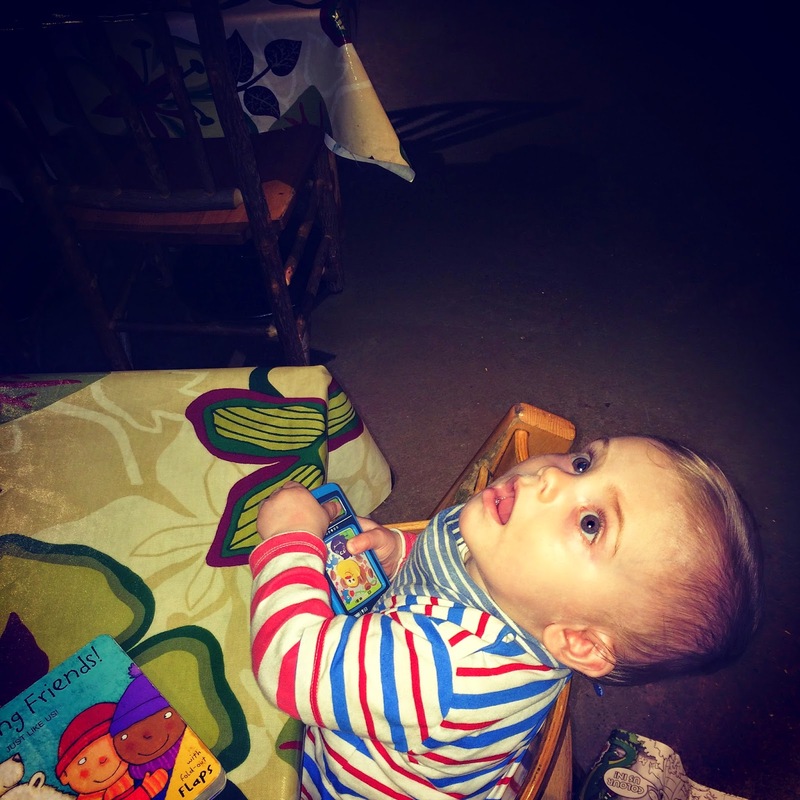 We settled ourselves at the table, staff members kindly bought us over two high chairs for the smaller children, and we set about ordering drinks and having a peek at the menu. Look at that face! "How can there be a storm inside Mummy?" Unfortunately, the youngest two did get a little overwhelmed at times by all the noise - especially from the elephants as they were pretty big and loud. 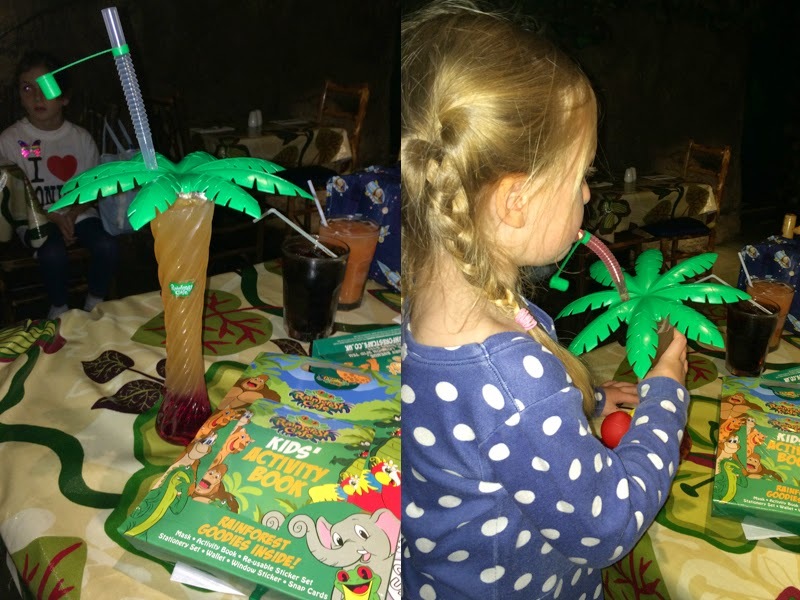 In all fairness, the staff did offer to move us to a quieter table, but we were settled and thought the kids would soon get used to the elephants as they 'go off' regularly. With hindsight, a quieter table round by the fish tanks may well be better for anyone in a party with smaller children, so that's worth baring in mind when you book your own table. Bar a few wobbles, the kids really did enjoy it - if you have a child with any form of interest in animals then this is absolutely the place to bring them. Cha Cha came to say hello, Bert just kept staring at him, then had a little wobble, bless! 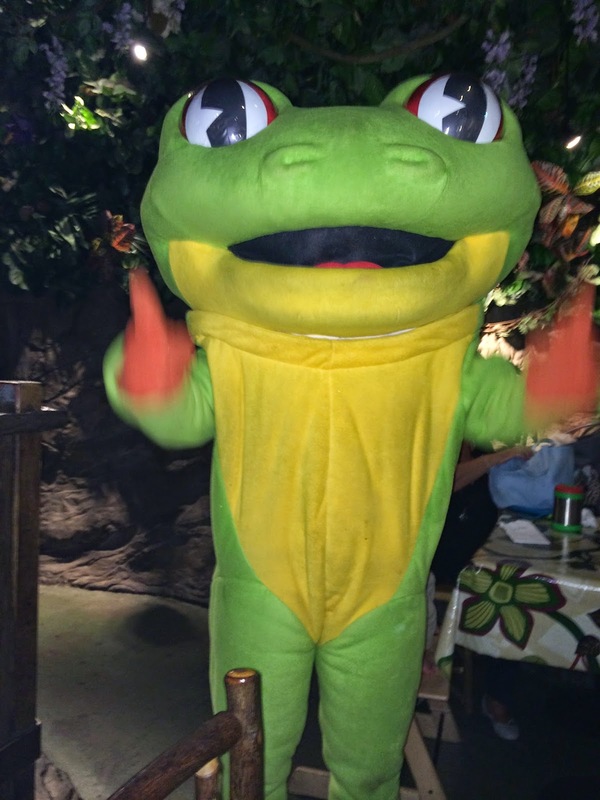 Then once we'd waved goodbye to Cha Cha we made our choices, and waited for our food to arrive. Organic pork and beef meatballs in a rich tomato sauce with spaghetti. Sprinkled with honeycomb, whipped dream & drizzled with chocolate sauce. A 4oz. handmade 100% beef burger served in a bun with lettuce, tomato and fries. Split banana topped with chcolate & vanilaa ice cream, whipped cream, chocolate & butterscotch sauce. 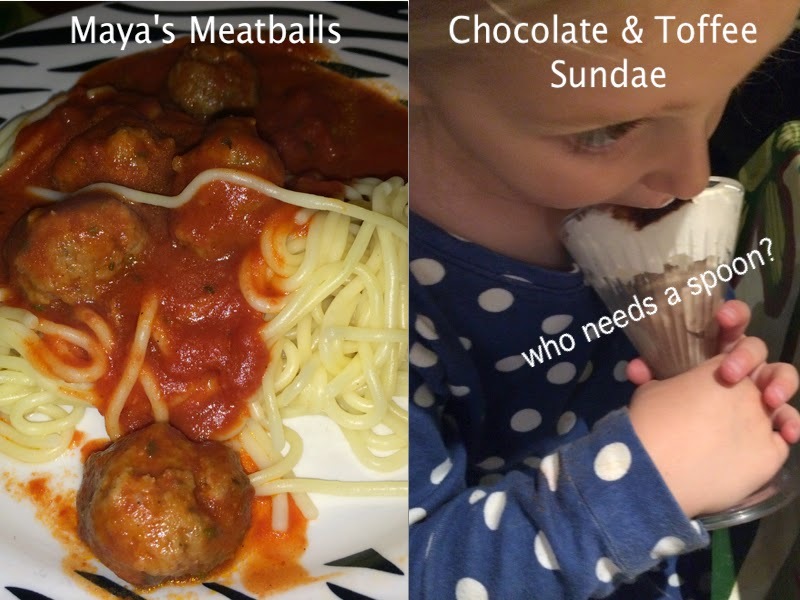 The children's portions were ample, which is always a pleasant surprise - so often children's portions can be too small and leave them feeling hungry and grouchy. 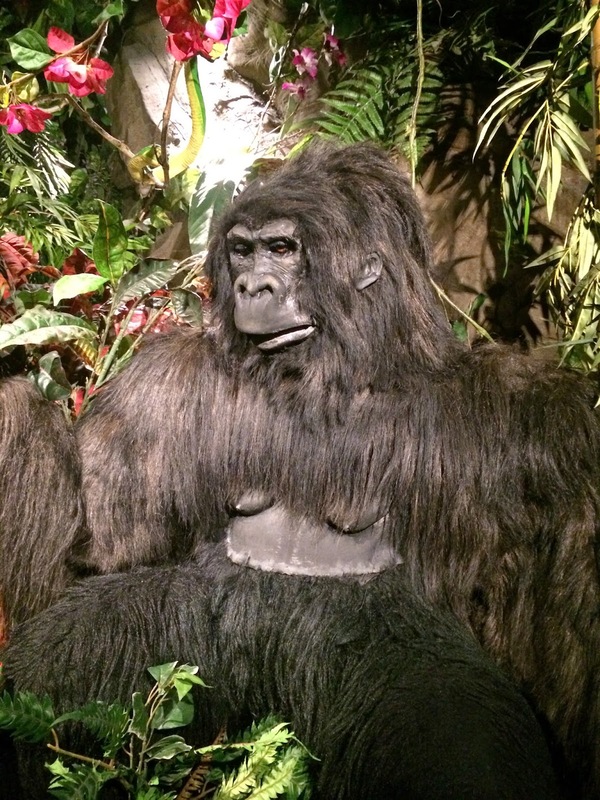 There was no chance of this at Rainforest Cafe. 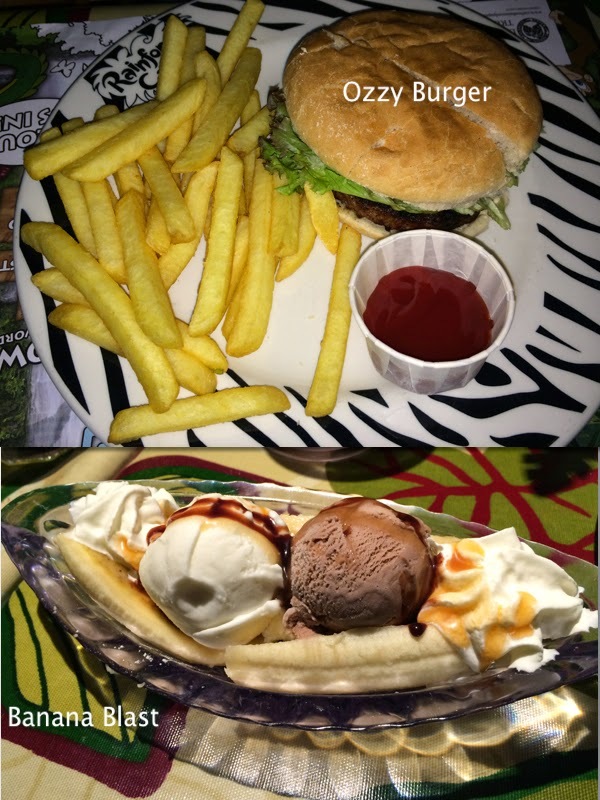 The food came really quickly (the staff bought out the children's main courses with the adult starters), which was good thinking - it gave the kids plenty of time to eat their mains, and we didn't encounter any hungry tantrums because we were eating before they did. 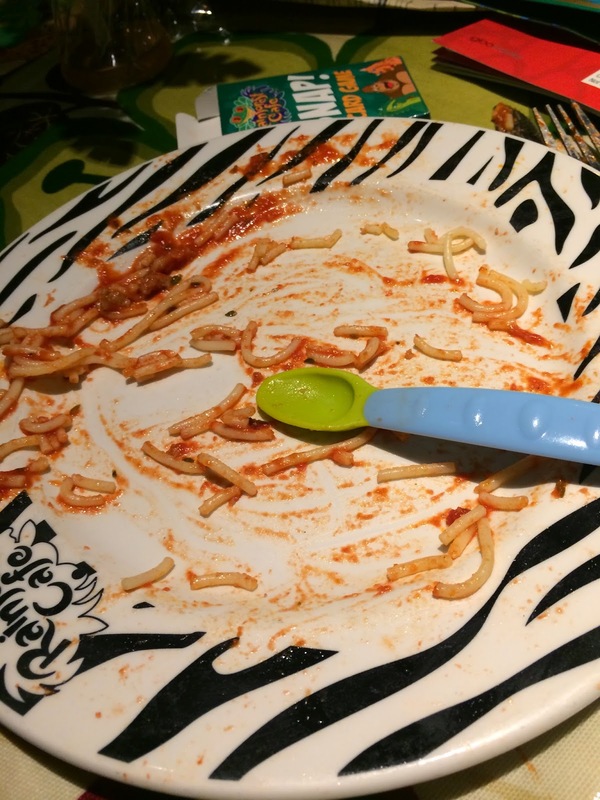 This empty plate is testament to how yummy the children found their food! 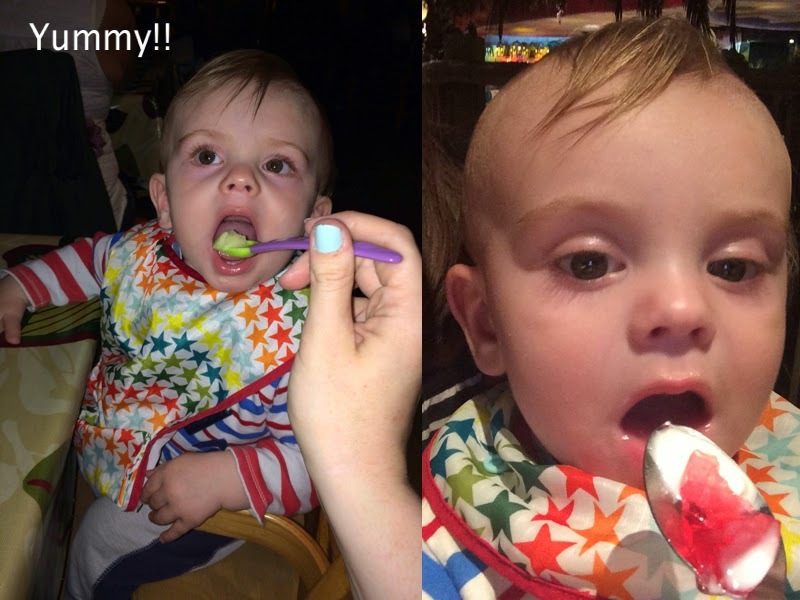 It was so lovely for me to give Bert his first taste of garlicky mashed potato, and jelly in such awesome surroundings - he absolutely devoured his dinner and dessert, and still managed to keep looking around at everything while he ate! 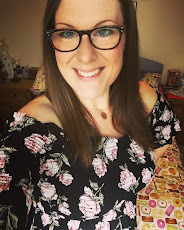 My friend Anwyn has been recently diagnosed with Coeliac disease and so cannot eat any gluten in her diet - we informed the restaurant at the time of booking of her dietary issues, and reminded them on arrival that we would need her meals to be safely free of gluten. 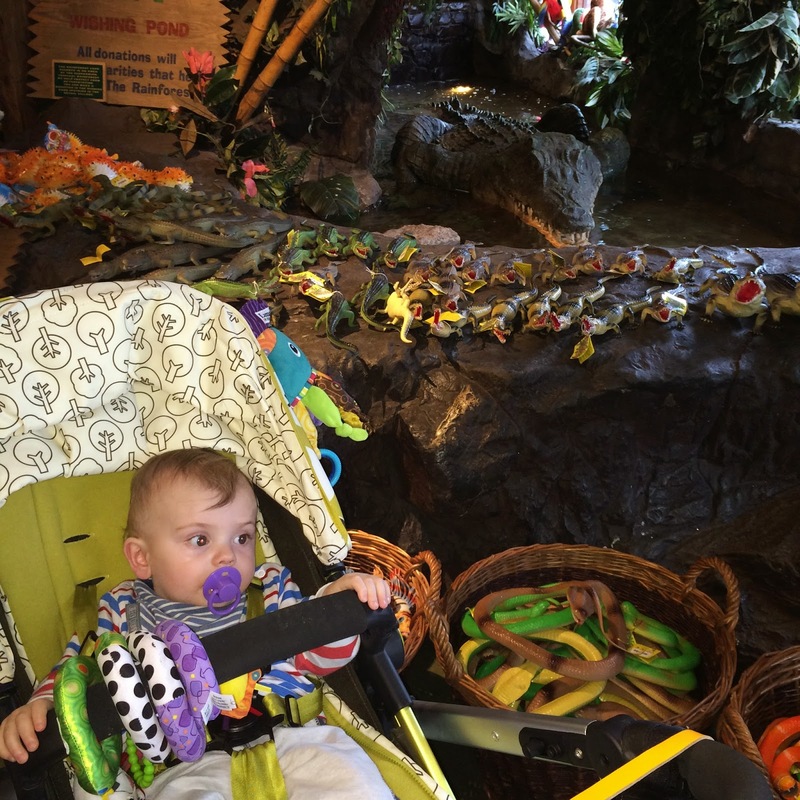 The Rainforest Cafe have great allergy information on their menu - each meal clearly states whether it is suitable for anyone with nut, egg, dairy and gluten allergies, so this was really helpful for us. 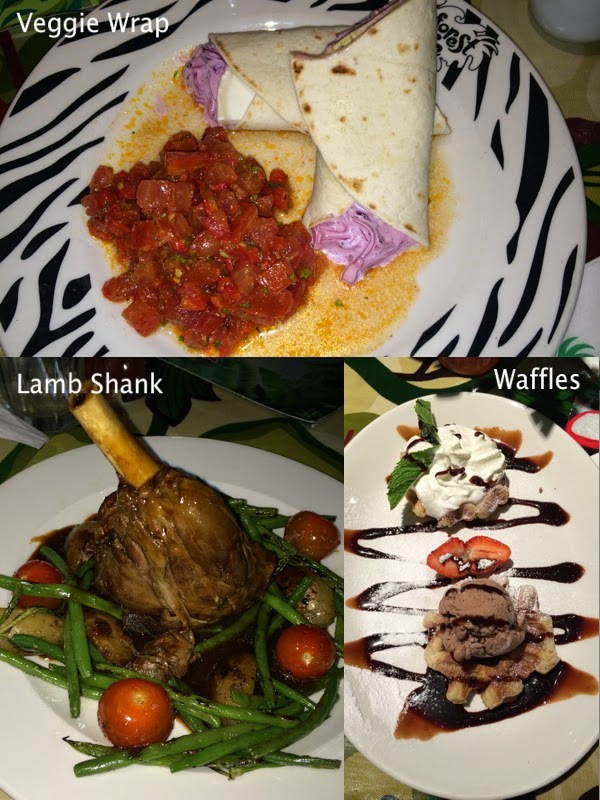 There is a wide choice of dishes for people without dietary restraints, but for my friend Anwyn, who is getting used to the limited choices her special diet causes, there was no choice for starter, four choices for main and one dessert available to her on the menu. 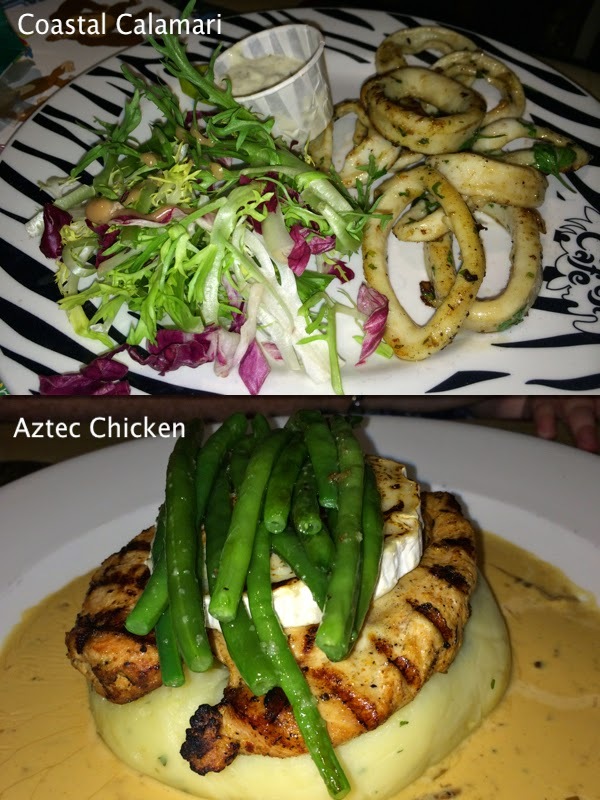 It is worth noting to any restaurateurs out there that at least a choice (between two meals) is preferable for anyone with an allergy - no one likes to have their choices made for them - so it would have been good to have an extra starter and dessert available which didn't contain gluten. However, it has to be said that the meals Anwyn had for her starter and main were very tasty, and it did make her order things that she would't ordinarily have chosen before her recent diagnosis - so that was cool. For Anwyn's dessert she didn't fancy the only gluten free option on the menu (which was just vanilla, strawberry or chocolate ice cream) so instead asked if they would be able to prepare her a Knickerbocker Glory without any gluten, which they insisted they could do no problem. The puddings arrived and Anwyn happily began to tuck into her dessert, before realising that the kitchen had forgotten to take off the wafer, which unfortunately contains gluten. She stopped eating as soon as she realised (she hadn't bitten into it, but just it touching the ice cream could have been enough to contaminate someone with Coeliac with gluten), the staff were extremely apologetic, and ensured they had told the kitchen how vital it is they pay attention to even the smallest detail when it comes to dietary requirements. It was a shame, as all other aspects of the meal were truly lovely. Thankfully, Anwyn didn't get ill, maybe due to the fact that she has only recently learned of her condition and started her gluten free diet. Still, it doesn't excuse it, and it could have made somebody very poorly. I'm reassured that the staff at RFC took this matter very seriously, and I feel confident it won't happen again. 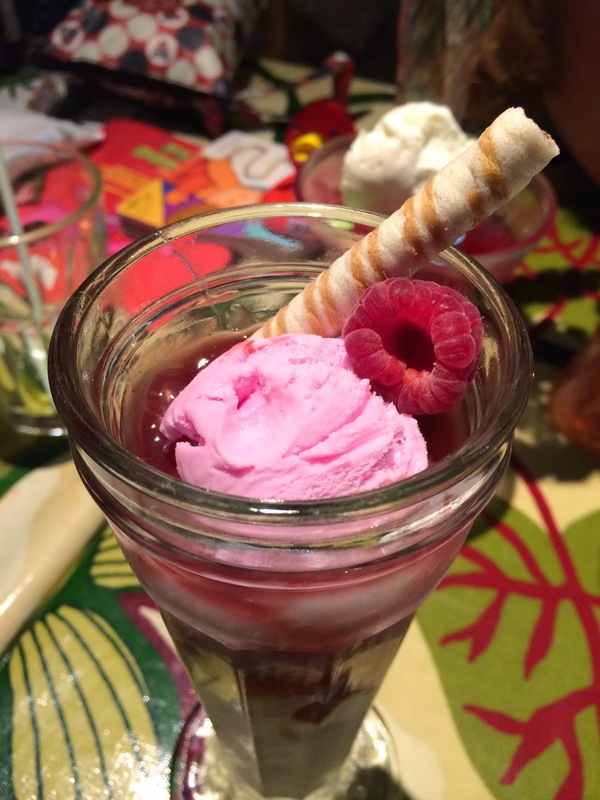 Knickerbocker Glory with offending wafer - it looked truly delicious though! Damn you gluten! Goat's cheese, red cabbage slaw, rocket leaves & guacamole, all wrapped in a flour tortilla & served with Mediterranean dip. Belgian waffle with chocolate ice cream, strawberry, whipped cream & drizzled chocolate sauce. My meals were SO delicious - I can't tell you how pleasantly surprised I was. The veggie wrap was so fresh and had exactly the right balance of richness from the goats cheese, zing from the salsa, and creaminess from the homemade coleslaw. The slaw was particularly great, as I have a real bug bear about horrible 'plastic-tasting' mass produced coleslaw you so often get in restaurants. No fear here, this was the real deal and just as good (if not better) than a slaw I could make at home. The meat on the lamb shank literally fell of the bone and was so tender, the gravy had a deep meaty taste and flowery edge from a hit of rosemary, the veggies were cooked perfectly al dente for me, and it took a lot of restraint to not lick the plate! What a treat dessert was - having been calorie counting for long now, it felt brilliant to have a major blow out and gorge on something so sweet and heavenly. The waffles were smothered with ice cream and chocolate sauce, and by the end I felt as if I needed a forklift truck to carry me out - good job well done RFC! Once we had finished eating, and while we were waiting for our coffees and babychinos to arrive, we decided to explore the rest of the restaurant, there is just so much to see! 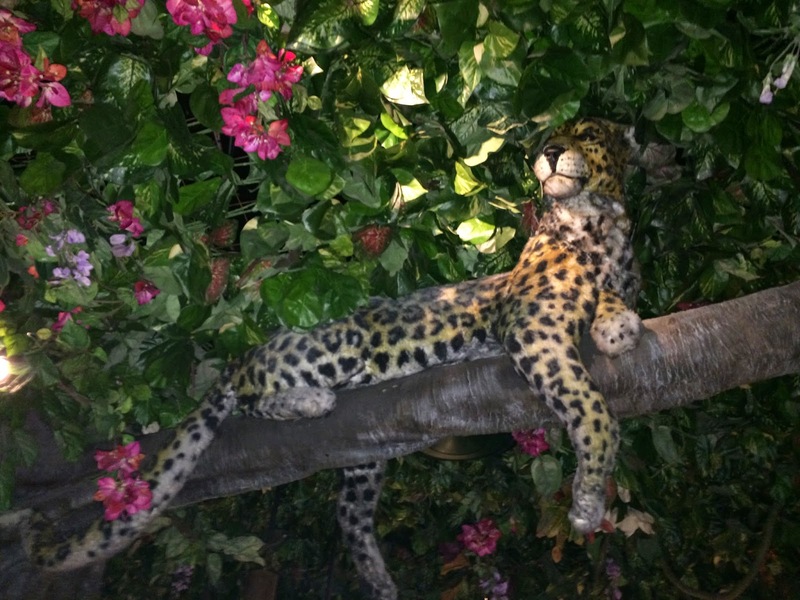 The Cheetah was so lifelike and moved its head every so often - in true rainforest style he is quite well hidden overhead, and the table of people eating underneath him hadn't even noticed he was there until we pointed him out! There was so much to look at I could have taken photos all day - I was particularly impressed with the attention to detail when it came to making the surroundings look and feel real - even I was amazed by the actual rainfall over the bar! Our bill would have come to around £150 if we'd have been paying for it, which granted, is quite pricey. What I will say is that for me, RFC is definitely a special occasion location, and it is offering an experience which isn't available anywhere else in London. It's on par price wise with other similar central-London based restaurants, and most importantly the food is really good: I don't mind paying higher prices as long as the quality of the food matches its price tag, and at RFC I thought it really did. 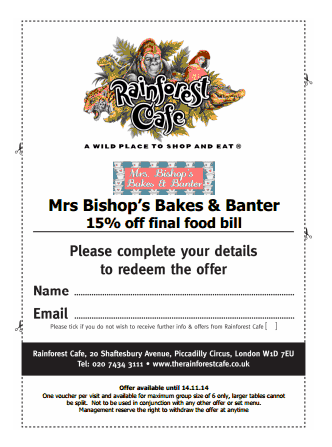 Luckily for you, my lovely readers, the wonderful people over at RFC have given me an exclusive 15% off final food bill voucher for any of my lovely readers to download, print and use at their restaurant. 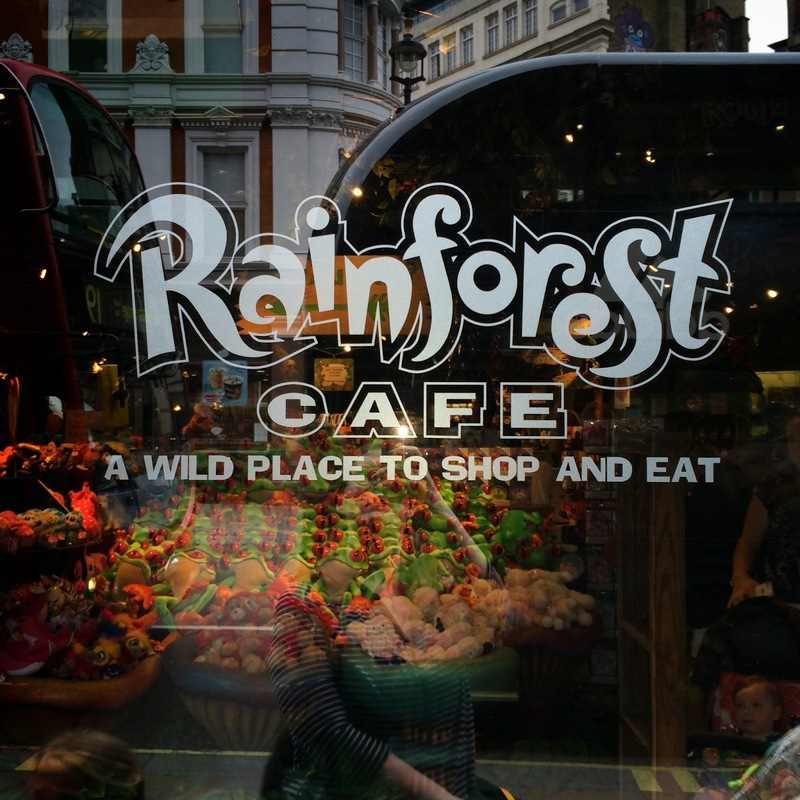 So, you can enjoy its scrumptious food and gloriously wild atmosphere for a fraction of the cost! 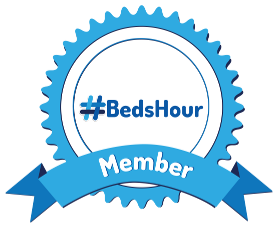 I'd love to hear all about your experiences when you go along, so do get in touch if you use the voucher, and enjoy! 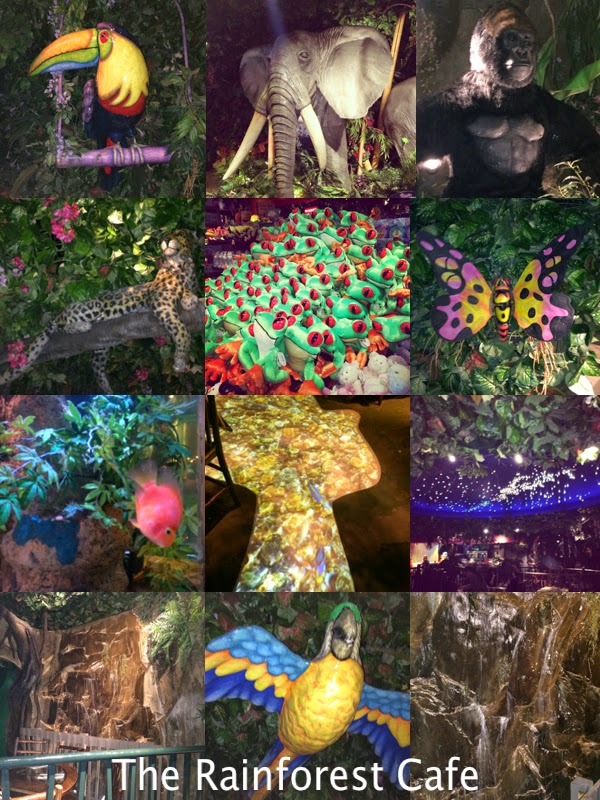 To sum up, I was really impressed with RFC: and would definitely recommend it for a special occasion. I think that probably, our children were a little too young to fully appreciate everything it had to offer, and older children (say aged 4-11) would be the optimum age to truly be blown away by its magic without being nervous or scared. 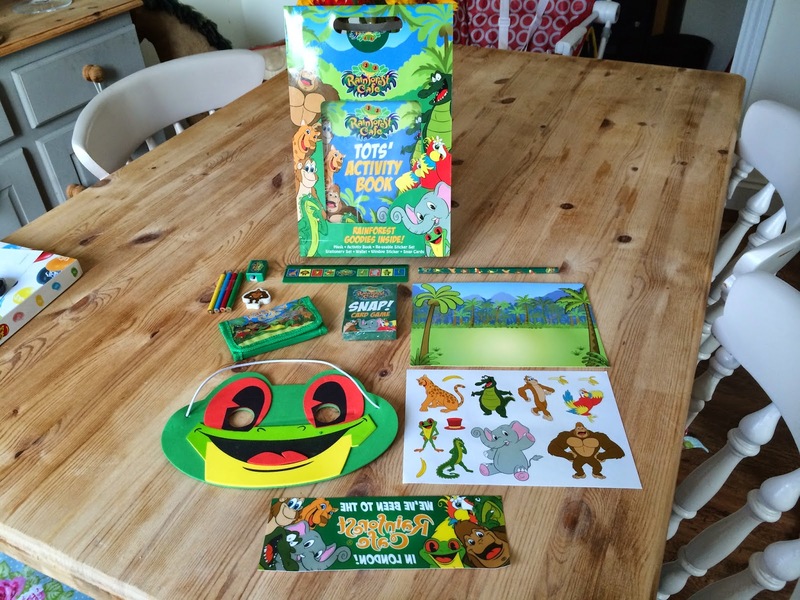 Although the prices are quite high, you get an awful lot for your money - the kids were so chuffed with their activity packs and awesome cups, that they didn't even badger us in the shop to spend more money. I will definitely be returning, next time with my husband, who is desperate to come along but unfortunately had to work on the day and so missed joining us for this fun adventure. Look at the love in his eyes! 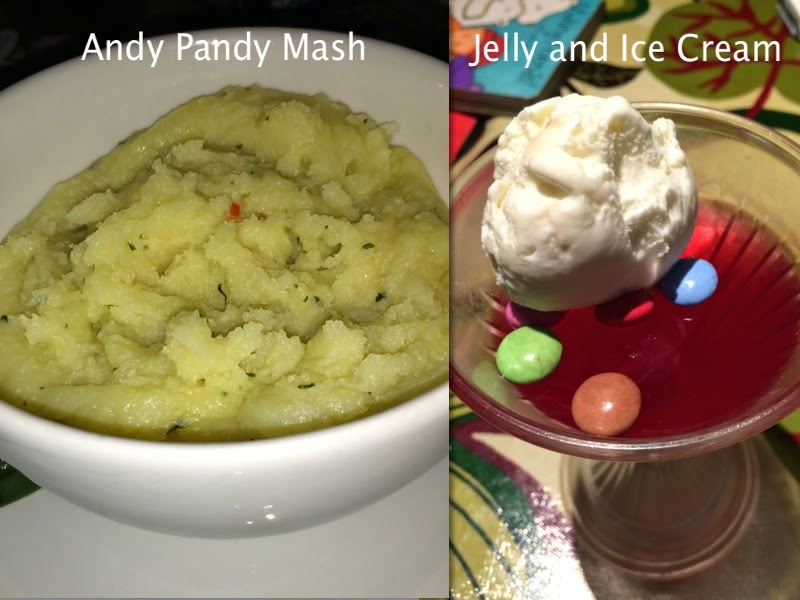 Disclaimer: We were treated to our meal, drinks, and the children's cups and goody bags for the purpose of this review, however - all words, pictures and opinions are my own. 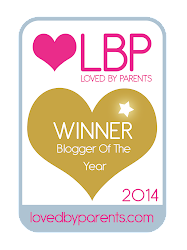 Please click below to download and print your voucher. Make sure you read all the small print on the voucher before use. What a wonderful gallery.Why don’t you share this link on some brillassignment channel?It can be very helpful for online visitors and permanent members.